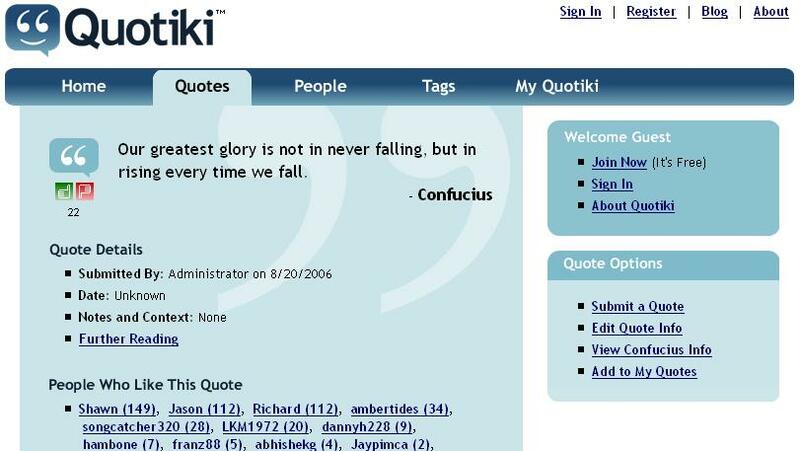 If you ever need to find an appropriate quote for that paper you're writing or maybe you just can't quite remember who said what, then Quotiki will come in very handy. You can search for quotes by people, tags, or by a short phrase. 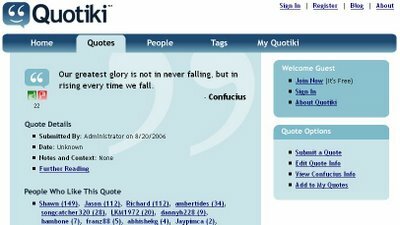 Launched in September, Quotiki has a community driven aspect as well: users can collect, rate, and tag quotes. The only comparable service I know of is Bartleby, which limits searches to canonical quote references like Bartlett's or Columbia Quotes. With Quotiki, you can even submit quotes so that raises the question of accuracy. If in doubt or you really need to have an accurate quote, go with Bartleby or check that the quote was submitted by Administrator. Thanks for the review. As for the accuracy of the quotes, right now we have quotes going through an approval, but when we have enough users, we'll let the "wisdom of crowds" decide which quotes need to be buried for any reason, including inaccuracy.